An economic assessment of short-term options for offshore wind energy in Scottish Territorial Waters noted that all OWF sites suitable for short-term development are entirely or partially situated within spawning or nursery grounds for one or more of the commercial species. While comprehensive integrated planning has since been put in place, the conflict is to a certain extent still ongoing, reflecting the specificities of each potential OWF development project. In the bay of Saint-Brieuc an offshore wind farm is being planned, amounting to 500 MW and spread over an area of 80 km2 16.2 km off the coast. Construction is expected to start in 2018 and the wind farm is scheduled to be operational in 2020. The main economic activities in the bay are commercial fishing and tourism. There have been fierce negotiations on the final location of the wind farm. A departmental committee was formed to have a discussion with other marine users and to highlight the importance of the fisheries sector. Scotland’s National Marine Plan was developed in 2015 building on sectoral plans. Sectoral Marine Plans reflect Scottish Government policies, and are used to steer the commercial scale of offshore wind development in more detail. A comprehensive process was put in place to ensure minimal conflicts in the locations suitable for OWF developments. For a long time, wind farms in the Dutch EEZ were not accessible to fishing vessels. In 2015 the government decided to change this. Multi-use options were to be considered that would allow ships to pass through offshore wind farms and that would also allow some types of fishing to occur. Conflicts between offshore wind farming and commercial fisheries have mostly been relevant in the North Sea, Baltic Sea and Eastern Atlantic. Member States keen to develop offshore wind farming are now looking to MSP to address these conflicts in a pro-active way. Accidental damage, including to subsea cables. Accidental damage and ship strikes, are a major concern. Snagging fishing gear is also a serious danger to fishers as it can cause a vessel to tip over or capsize. Disturbance of species. Construction and operation of offshore wind farms can disturb mobile and sessile species, leading to displacement of or reduction in fish and shellfish resources. Ecological consequences of spatial exclusion. Spatial exclusion, even if it is voluntary in terms of risk aversion, can lead to reduction in or loss of access to traditional fishing grounds. This in turn leads to the displacement of activity to other (potentially less profitable and/or less reliable) fishing grounds, increasing fishing pressure there. Economic consequences of spatial exclusion. Obstruction of navigation routes to and from fishing grounds can lead to increased steaming times. Small scale fisheries may not be able to compensate for the increasing cost of operation, and some fishing grounds may no longer be accessible for small boats at all. But there are also higher initial costs for developers if they have to agree on co-existence with fishery as a prerequisite to obtaining their license. Socio-cultural conflicts. In some cases, conflicts between offshore wind farming and fishing masks a deeper conflict. Fishers may perceive offshore wind farming as the last arrival in a long line of restrictions, threatening not only livelihoods but also a traditional way of life. In many countries, fishing vessels are not permitted to enter offshore wind farms. Changes in risk perceptions models may soften these spatial restrictions in future. 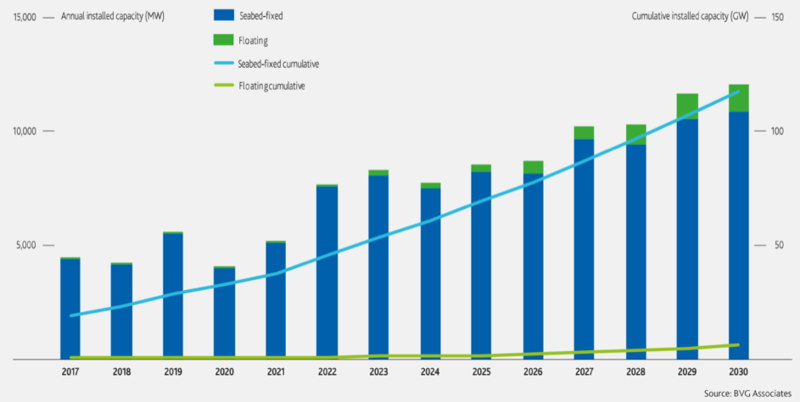 Particularly in Scotland, significant OWF developments are expected in the coming years (Figure below). This is due to ambitious government targets to meet 100% of Scotland’s electricity needs from green sources, including offshore wind, by 2020. The future offshore wind developments are also expected to support the attainment of the decarbonisation target of 50gCO2/kWh by 2030 (to cut carbon emissions from electricity generation by more than four-fifths). The Scottish Energy Strategy published in December 2017 sets out the Scottish Government’s vision for the future energy system in Scotland. Moreover, the Climate Change Plan published in February 2018, sits alongside the Strategy, and provides the strategic framework for transition to a low carbon economy in Scotland. An important driver of conflict has been that in many countries, fishing vessels are not permitted to enter offshore wind farms. Changes in risk perceptions models may soften these spatial restrictions in future. Fisheries are expected to remain under economic pressure as a result of quotas, rising costs such as fuel and other fishing restrictions. The occurrence and distribution of species may change in response to climate change, requiring fishers to respond flexibly. Added areas set aside for offshore wind farming are likely to increase pressure on the sector, especially smaller operations working closer to the coast. A more fundamental question is how to make trade-offs between offshore wind farming and fisheries. Apart from monetary value, non-material value, such as the value of artisanal fisheries for cultural identity. Trade-offs are therefore mostly policy-driven and cannot be based on cost-benefit analysis alone. 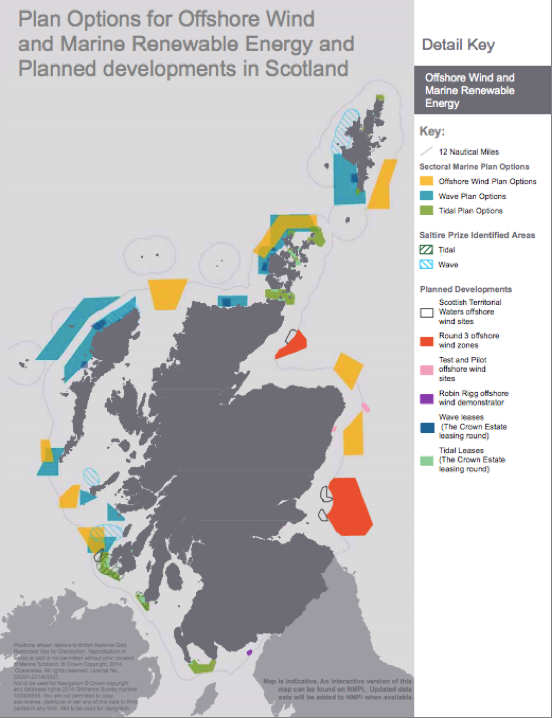 In Scotland, all sectoral objectives and maritime plans reflect the strategic UK High Level Marine Scotland created the Marine Scotland Act in 2010 and adopted the UK Marine Policy Statement in 2011 as a framework for preparing integrated Marine Plans and decision making. The Policy Statement commits marine planning authorities to considering the potential social and economic impacts of OWF developments on fishing activity and to encourage opportunities for co-existence between fishing and other activities. In Poland, the MSP process revealed the importance of commonly agreed concrete targets and goals for offshore wind energy. In response, the Polish Parliament has now begun to elaborate a National Programme for the Development of Offshore Wind Energy (Narodowego Programu Rozwoju Morskiej Energetyki Wiatrowej). Fishers can be difficult to include in the MSP process as they are may be suspicious of MSP as restrictive and conservation-led. This was the case in Poland, for example, where special efforts were made to draw artisanal fishers into the process. Fishers were interviewed in person as a first step. Based on the results, two extra meetings were organised for fishermen during the MSP process. One was focused on general problems of fishers while the second was devoted to discussing solutions for coexistence between fishers and offshore wind farms. This yielded important background information for the planners and helped the development of “fishery friendly” MSP solutions. Marine Scotland conducted a participatory fisheries mapping project, known as ScotMap. The aim was to improve knowledge of the distribution of fishing activity by smaller vessels without Vessel Monitoring Systems (VMS). Data were collected during face-to-face interviews with 1090 fishers. Interviews identified sea areas that were used for fishing, together with an estimate of the contribution these areas made to vessel earnings in the period 2007–2011. The data collected was used to produce maps showing fishing intensity and socio-economic importance of different sea areas to fishers. In Poland, a special study was carried out to identify the most important fishing grounds for artisanal fishers. The planning team from the National Marine Fisheries Research Institute contacted small-scale fishers (without VMS) in person. A special map was elaborated based on this information that was fed into the draft MSP planning process. It makes sense to run a careful area selection process to ensure conflicts between offshore wind farms and fisheries are kept to a minimum. This may involve initial scoping exercises and subsequently narrowing down location options in consultation with stakeholders (see Story 3). It could also involve scenario mapping to inform communities of the effects of project construction, operation and maintenance activities, and also to assess the socio-economic and environmental implications of a proposed development. Careful selection processes can make choices more transparent, and stakeholders can be involved from the beginning, building better relations between the sectors. In Scotland, the Fishing Liaison with Offshore Wind and Wet Renewables Group (FLOWW) was set up to foster good relations between the fishing and offshore renewable energy sectors. The group consists of regulatory bodies, offshore wind, fishery and aquaculture sector representatives, individual businesses, research groups and other relevant bodies. A specific output has been the Offshore Renewables and Fisheries Liaison Guidance developed by the group. Maritime Spatial Plans can be used to favour OWF project proposals that enable co-existence with fisheries both spatially and temporally. Interaction matrices could be used to identify potentials for coexistence which could then be made a licensing condition. During the planning process, technical solutions can also be discussed with the industries with an aim of identifying potentials for co-location and enhancing synergies (such as access to technical staff, vessel access, port facilities, emergency systems, monitoring systems). The Ocean Multi-Use Action Plan, developed as part of the MUSES (Multi-Use in European Seas) project, provides several examples on how synergies have played out across the EU, what are the particular challenges for their implementation and recommended actions. Scotland has experienced successful examples of co-locating specific types of fisheries (especially static gears) and offshore wind farms. During the offshore wind farm planning process, technical solutions are discussed with the sectors with an aim to identify the potential for co-location and enhance synergies between the two activities. Furthermore, good practice guidance for community benefit for OWF development has been drawn up for developers, which is used where appropriate. Interactions may also include access to the same pool of human resources (e.g. access to technical staff) as well as infrastructure and other technical resources (e.g. vessel access, port facilities). In the Polish MSP, blue corridors were established for the purpose of ensuring safe migration of diadromous organisms. In these corridors, any construction is prohibited that could hamper such migration. While this does not affect offshore wind farms in Poland as they are located outside these corridors in any case, they can also be used by fishing vessels. They can thus serve as an example of how to mitigate conflicts between fishery and offshore energy. Allowing vessels to transit offshore wind farms can help fishers access important fishing grounds. In the Netherlands, transit rules are currently being piloted in three offshore wind farms (see Story 5). 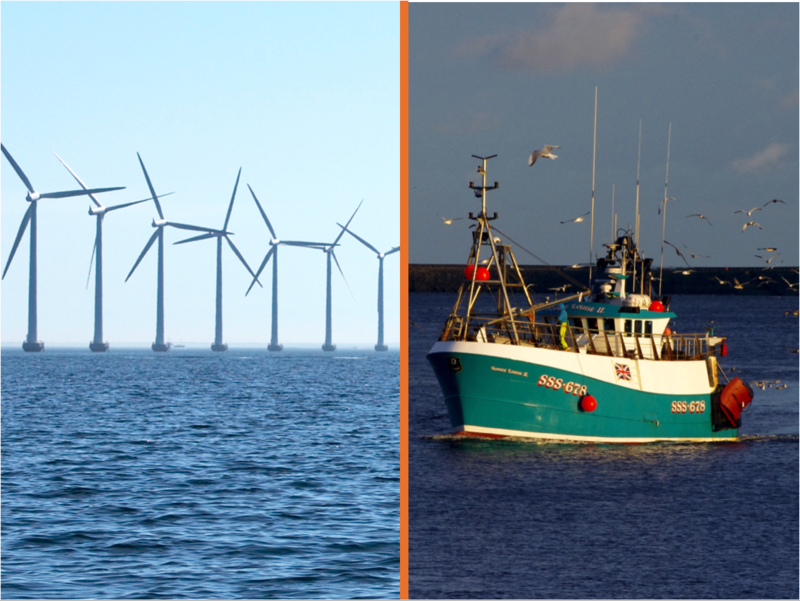 Another option is to make available corridors between offshore wind farms or turbines to allow fishing vessels to pass, safely even in bad weather conditions. According to the Polish draft plan offshore wind farms should be navigable for ships up to 50 meters length with the exception of areas in close proximity to offshore constructions. On top of this, the plan envisages some safety passage(s) for larger ships which can also be used by fishers during bad weather conditions. Such a passage between wind farms farms was placed in front of the important fishing harbour of Ustka, allowing safe navigation to important fishing grounds at Słupsk Furrow. Temporal closures of the OWF in certain seasons for certain types of fisheries could be an option as to ensure that safety requirements are met and that the impacts on fisheries are reduced. Such closures can be optimised as to coincide with construction works on the OWF, as well as with fishing seasonality. However, for such initiatives, close cooperation and exchange (i.e. what are preferable fishing seasons, when is it easier to have construction works, when is major O&M to take place) between the two sectors is crucial. Extensive engagement and constructive discussions between the two sectors can result in collaborative arrangements whereby synergies between the two sectors are exploited (e.g. fishing boats used for monitoring during the construction and operation of the OWF). Other examples are to identify trade-offs, mitigation or compensation measures. In France, a memorandum of understanding has been signed between the Departmental Fisheries committee and the developer which will lead to various benefits for the fishing community. Information gained from existing OWFs and their effect on fisheries can be used to advise future requirements and restrictions but also possible trade-offs and synergies. The Scottish Offshore Renewables Research Framework provides a collaborative and co-ordinated research programme that informs future marine planning and decision making for OWF developments. A coordinated national, regional and project specific environmental monitoring strategy is also useful to identify potential opportunities for enhancement and recovery of fish stocks in the exclusion zones around OWF sites. Using GIS, socio-economic analysis, research on various specific topics and strategic monitoring can all contribute to improving the knowledge base upon which decisions are based. Such knowledge can be made available as part of Marine Atlases. To lower the potential conflict between offshore wind farms and fisheries policies, licensing manuals and guidance notes can be developed by the authorities and made available to OWF developers. These address developers and decision makers and seek to ensure that all necessary requirements are met before development proceeds. A good example in this regard is Marine Scotland’s repository of guiding documents and studies available online.